Get a great price on the Wismec Predator 228 Kit from Vapor DNA. You don’t normally hear the phrase “Alien vs. Predator” in a conversation about vaping, but that’s pretty much what everyone in the vaping community has been talking about since the launch of the new Wismec Predator 228. 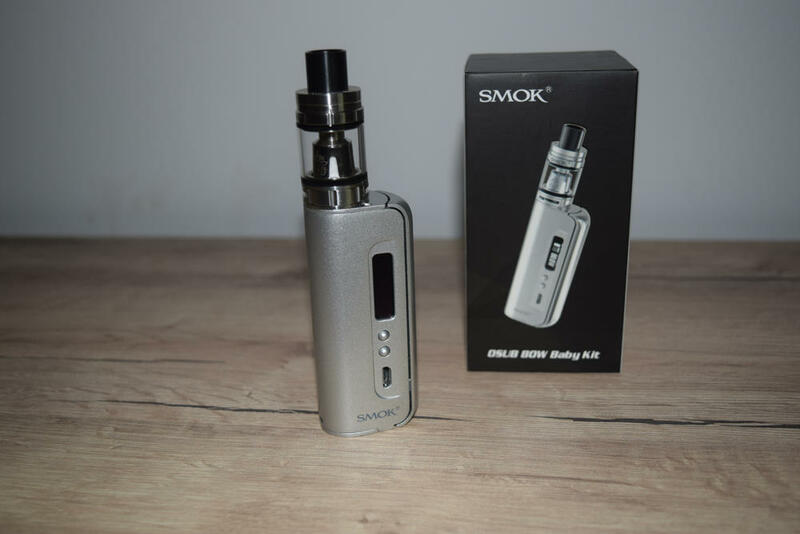 That’s because this new device has been strategically named and deigned to directly compete against SMOK’s massively successful Alien 220W and become the most popular dual-18650 battery device on the market. 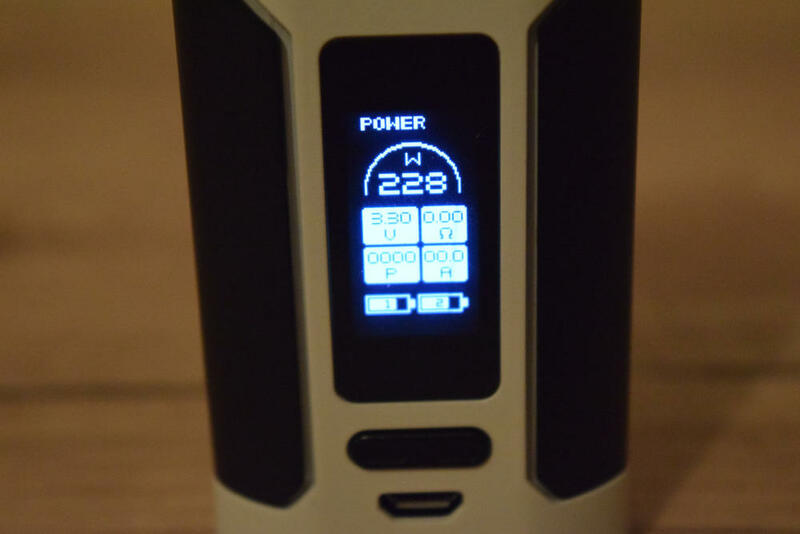 Having used the Alien for a long time, I can say that Wismec has set a really high goal for its new flagship, but the Predator does come with some pretty nice and innovative features, so it’s definitely not impossible. 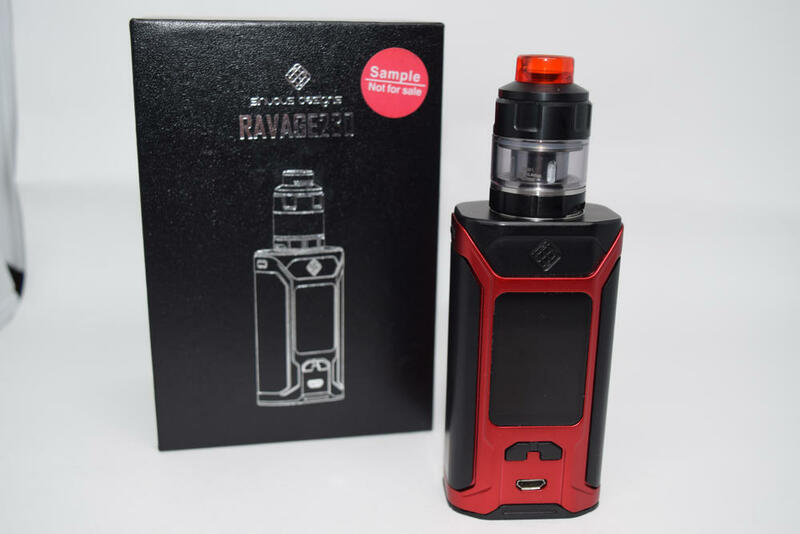 The Predator 228 kit comes in a large cardboard box with a photo of the mod on the front and a list of contents and company information, on the back. Inside the box, we have the Predator 228 vaporizer sitting in a foam holder, and underneath that are the included tank and accessories. For this kit, Wismec has paired their new device with an advanced sub-ohm tank called the Elabo. It’s got a really nice design and an innovative refilling system, but we’ll get to that later. The kit also includes a USB charging cable, two different coil-heads for the tank, and a user manual. That’s about it, and I’m not happy about that. I mean, if you’re going to include a decent tank in this package, at least throw in a bag of spare o-rings for it, and most importantly, a spare glass tube. Those things are life-savers, and if you’ve ever cracked a good tank, you know exactly what I mean. This may seem like a small detail, but it’s actually a big con for me, but one that can easily be fixed by simply adding these accessories in the next batch of kits. Hopefully, Wismec will take this into consideration. Wisemc has become known for its collaboration with Jay Bo on its popular RX series of mods, but for the Predator, the Chinese company has teamed up with a company called Sinuous Designs. No one had ever heard of these guys until a month ago when Wismec finally released a video which revealed Sinuous to be Jon Fairbanks, a designer who had been working alongside Jay Bo for quite a while. Apparently, Wismec decided a change from the Jay Bo brand would be good, so they went with “designed by Sinuous, manufactured by Wismec” this time around. The logo on the tank, that’s the Sinuous logo, and I have a feeling we’ll be seeing a lot of it in the future. Now, for the design. 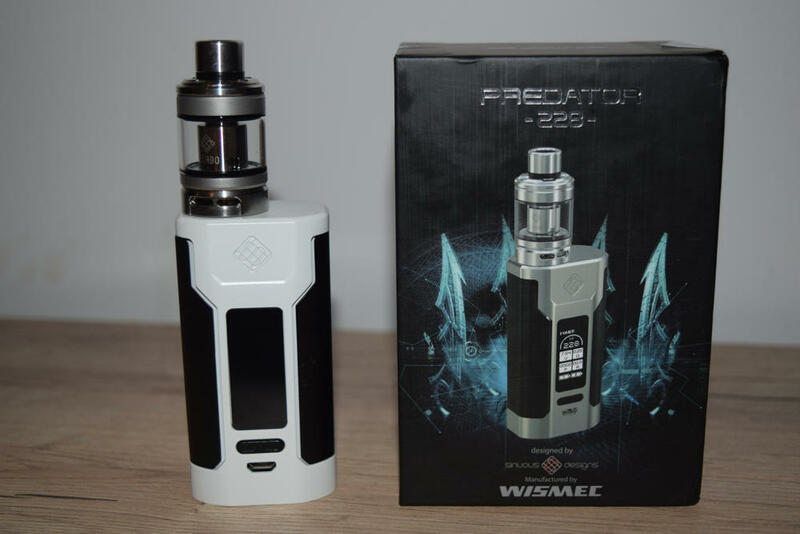 When I first saw photos of the Wismec Predator 228, I had no idea it was going to be marketed as a competitor for the SMOK Alien 220W, but the design similarities were obvious. They have the same general lines, the same style fire button, same battery door and even a central display. At 86.7-mm-long, the Predator is slightly taller than the Alien, but in terms of width and thickness, the two are almost exactly the same. The Predator has a very clean look to it. Apart from the two small navigation buttons under the display, there are no other buttons visible on the device, because the firing bar is disguised as one of the two black pannels on the sides of the mod. Then you have the minimalist Sinuos logo above the display, on one side, and the “Sinuous” and “Predator 228” logos on the other, but these are almost invisible. I don’t know if they did this with all colors, but mine is white and so is the writing on it, so unless the light hits the mod from a certain angle, you can’t even see it. I like it, though, because it just keeps me focusing on the beautiful design of the mod. The battery door on the bottom of the Predator 228 is very similar to that of the Alien 220W, with the only addition being a switch that locks the door in place. It’s a bit of a pain to open when the battery compartment is empty, but when you just need to remove the batteries, the tension pushes the door open. It’s a nice quality battery door, I like it. The firing bar is also very similar to that of the Alien, both in design and in the way that only their bottom section can’t actually be pressed down. The only difference is the resistance to squeezing. The Alien 220W bar requires a lighter press, but that of the Predator 228 is considerably stiffer. I really have to put a bit of muscle into it when vaping, and not keeping the pressure up throughout the whole draw will just cut off power. I personally don’t have a problem with that, I’d rather it be stiff than wobbling or rattling, but for a girl it might be a bit difficult to operate. Finally, one of the most important design features of the Predator 228 mod, the new and improved 510 connection. 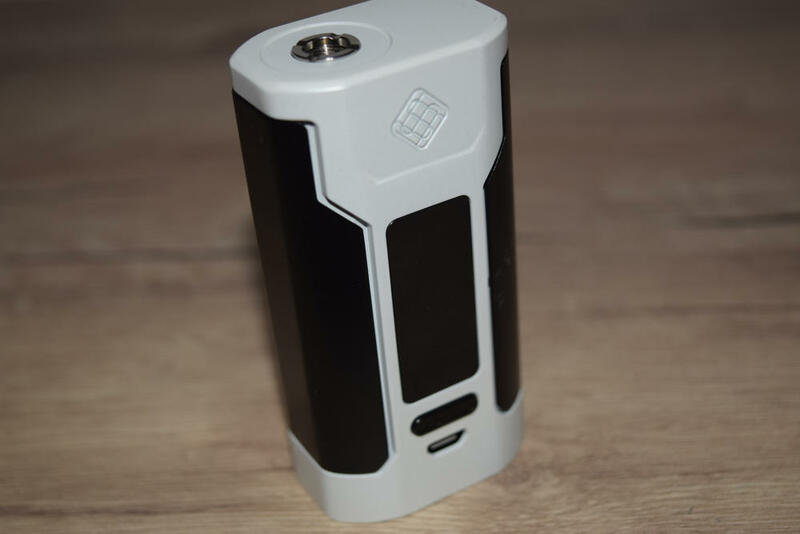 Wismec had been getting a lot of flack for its poor 510 on the otherwise stellar RX mods, and they finally decided to change it. This one is infinitely better, with the pin now having the perfect amount of throw to it in order to accommodate even long pin atomizers, like the ones made by SMOK. 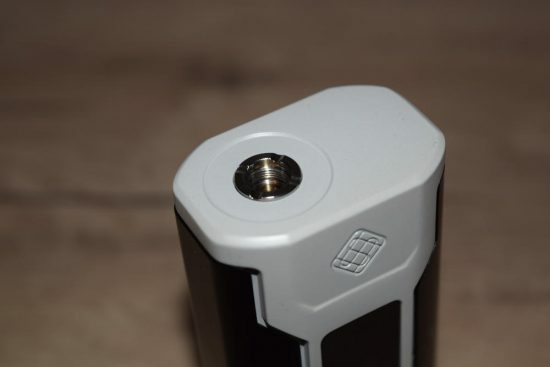 Another improvement is that they moved the 510 from the edge of the mod more towards its center, which allows you to use atomizers up to 28-mm in diameter without the slightest bit of overhang. Even 30-mm tanks look great on the Predator, because the overhang is barely noticeable. This is a big plus. Everyone was talking about the great 510 on the Predator 228, when this happened. 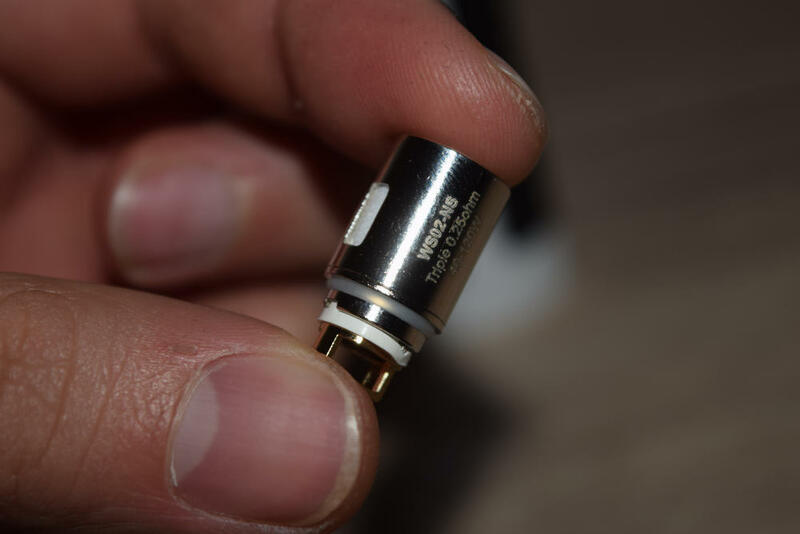 Basically, DJLsb Vapes, a popular YouTube reviewer, announced that the negative threads of the 510 connection on his mod had come off, which other people had reported before. But since has kind of a big deal in the vaping community, news of this issue spread like wildfire. Apparently, the threads are simply press-fit into the mod, and may come off if enough pressure is applied, like when trying to unscrew a stubborn tank. I don’t think we’re going to be seeing a recall, but I do hope Wismec fixes this problem on the next batch of Predators they send out to retailers. I for one have not had this issue, but judging by reports from several trusted reviewers, the connection threads to come off very easily if you apply just a bit of pressure. I’m not going to try it, because I quite like my mod in working condition, but it sounds like a general problem, not some isolated incidents. But 510 problems aside, the Wismec Predator 228 is a very well-made device. I love the design, the mod feels very solid in the hand, the buttons and firing bar are clicky and responsive, and there’s basically no rattling. As Kanye would say, the SMOK Alien 220 had one of the best displays of all time. It was large enough to see clearly even when holding the mod at arm’s length, bright, and had lots of information available on the home screen at all times. Some people complained that it showed too much information, but I don’t know how anyone could see that as a con. I mean it even showed the chip temperature, it was just awesome. It was always going to be tough for Wismec to come up with something better, and as far as I’m concerned, the display of the Predator is slightly inferior. 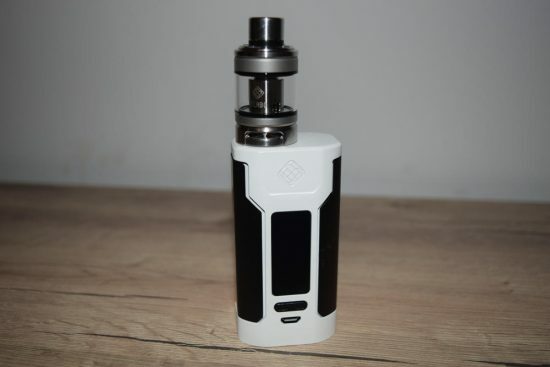 There’s nothing wrong with it, it’s got a good size, it’s probably a bit brighter than that of the Alien 220W, it has separate battery indicators, which is awesome, but it shows much less information than the SMOK device, and you have to go into the settings to check or change what is shown on screen. Again, some people love it for its simplicity, and at the end of the day it’s just a matter of personal taste. I’ve decided not to go into great detail about the menu navigation, simply because it involves going through a number of button combination to cover every little thing and that can be a bit confusing to read. Plus, everything you need to know is in the user manual. 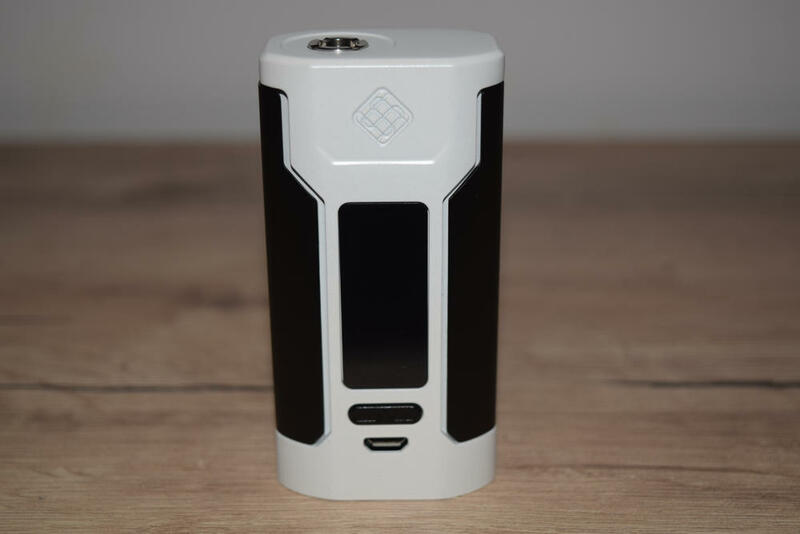 I am going to mention that the navigation system is very similar to that of the Wismec ReuleauxRX Mini and other advanced Wismec mods. There’s no proper menu to browse, like on SMOK devices. Instead, you press the fire bar three times until the first word on the screen starts to flicker, and then use the buttons to go over the various on-screen options to adjust them. It sounds easy, but I found it a bit overwhelming at times, due to the high number of button combinations required to make changes. You adjust some things when the device is on, others when it’s turned off, sometimes you have to hold two buttons pressed for a few seconds, other times you can press them quickly to input the changes. 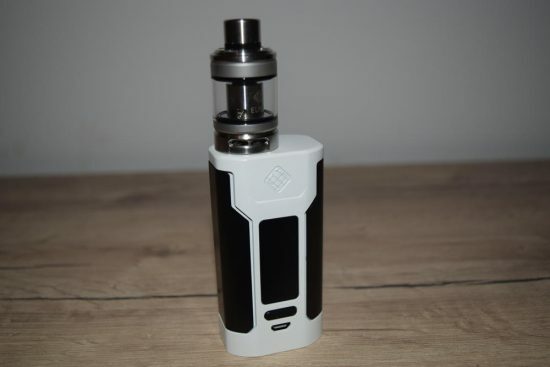 The navigation system reminds me a lot of the one used by Joyetech on its advanced mods, only the Predator 228 is one of the most feature-rich devices I have ever used, so navigation is even more complicated. I’m personally a fan of old-fashioned menus, and particularly love the one available on iJoy mods like the MAXO. But, if you’re already familiar with the Wismec-style menu, or if you don’t mind a steeper learning curve, you should be fine. In terms of features, the Wismec Predator is very impressive. Apart from the standard Power, Temperature control and TCR modes, all of which are highly customizable, Wismec has also included some cool new features. 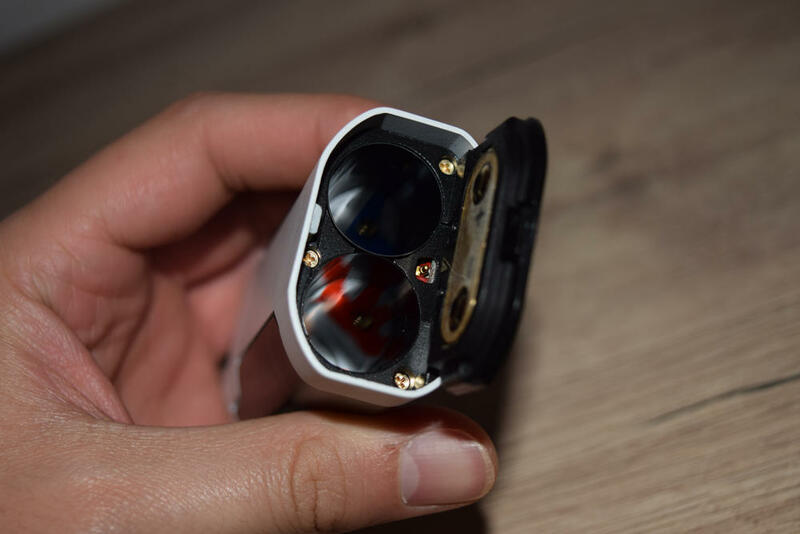 First, there’s the Preheat option, which allows you to set the power a bit higher than you’re normally vaping on for a few milliseconds to get the coil hot faster. Say you’re vaping at 60W, you can set the preheat to 85W for 0.4 seconds, to bring it up to the right vaping temperature faster. 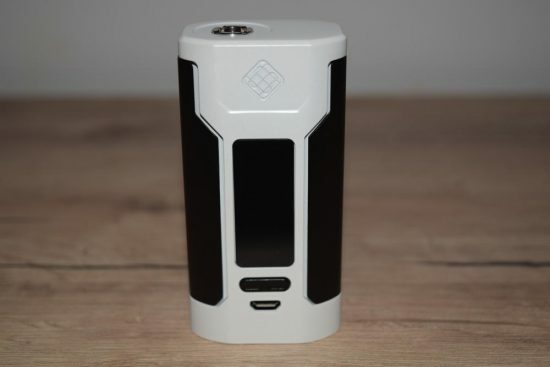 It’s similar to the vaping effects we’ve seen on a lot of advanced SMOK mods since the good old X Cube 2. One of my favorite new features is the on-board 2 Amp battery charging. This is a big pro over the SMOK Alien 220W, which didn’t even support on-board battery charging. Instead you had to have an external charger to safely recharge them. The Predator 228 not only features balanced charging, but also charges the two 18650 batteries a lot faster then basic on-board charging. The device does get a little hot while charging, so using it as a passthrough is a little scary (at least for me), but otherwise it works great. 2 Amp charging is a neat little feature that I’d like to adopted by other manufacturers in the near future. Finally there is the power bank feature, which allows you to use the Wismec Predator 228 as a power source to charge your other gadgets. This is handy if you’re running low on phone battery with no other power sources available, but the downside is that you need a special adaptor that doesn’t come in included in the kit. So I didn’t get to test this option myself, but it does sound pretty cool. If the charging adaptor isn’t outrageously expensive, I think it’s a worthy investment. 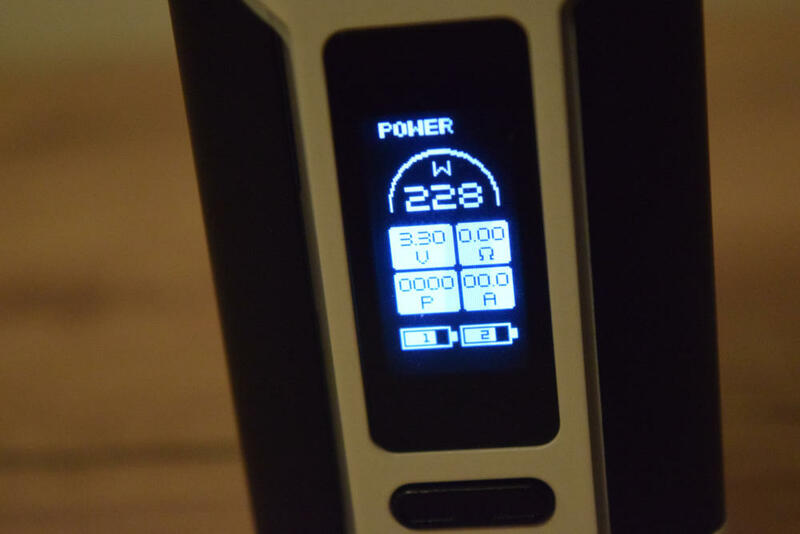 The Wismec Predator 228 has a maximum power output of 228W and 50A, which is pretty much as good as it gets with a regulated dual 18650 battery mod. Manufacturers regularly make bold claims about the maximum power of their devices, but the results of real-life tests often show that they are exaggerated. That doesn’t seem to be the case with the Predator. DJLsb Vapes, the go to guy for mod technical information online, tested the device using specialised software and found that Wismec’s new flagship has a real max output of 225W, which is pretty darn accurate. 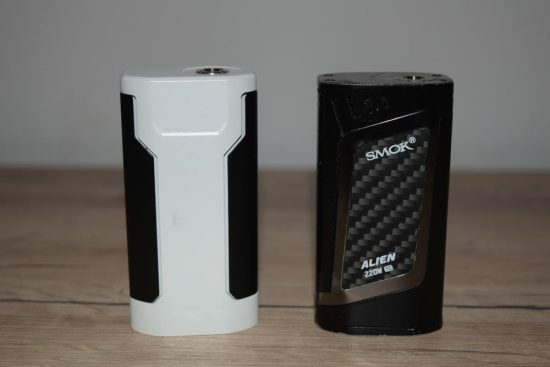 I don’t really know what the true power output of the SMOK Alien is, but since the official claim is 220W, the Predator has it beat, although you’re unlikely to feel the difference when vaping. In power mode, the Predator 228 supports atomizer resistances between 0.1Ω and 3.5Ω, so it’s suitable for extreme sub-ohming and MTL vaping. 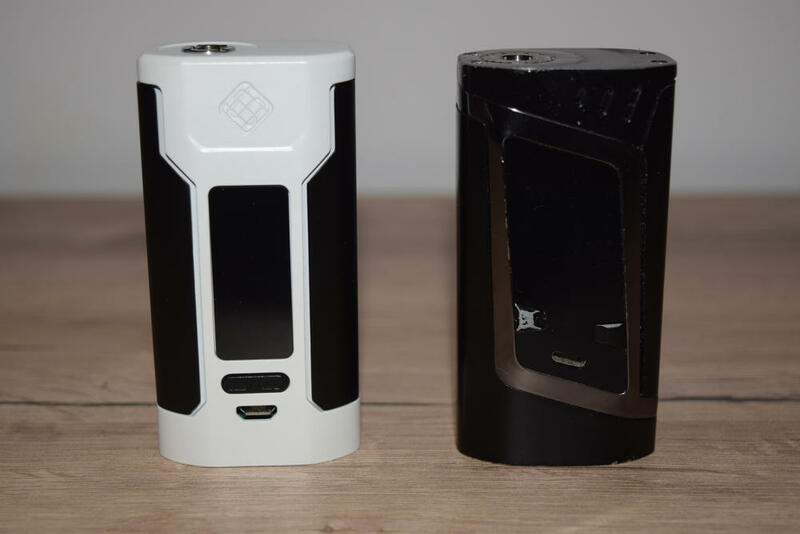 Wismec has also included a feature called Buck-Boost Technology, which is supposed to ensure consistent power output regardless of the batteries’ charging level. Another great thing about this mod is the extended battery life you get compared to the SMOK Alien and many other devices. That’s because Wismec’s chip allows you to drain the batteries down to 3 volts, which is about 0.5V than most other 18650 devices. It’s still completely safe but keeps you vaping for longer. As always, I’ve mostly used the Predator 228 in wattage mode, and for the most part I’ve thoroughly enjoyed the experience. The pre-heat option works very well, the firing bar is responsive and the power output feels impressive. I did notice one small con, but it’s definitely not a deal-breaker. Technically, the Predator has virtually no delay when pressing the firing bar, but if you stop using it for about 10 minutes, it goes to sleep, an when you press the bat again after that, it takes about a second for it to activate the battery. A second is not very long, and if you have the pre-heat set to a higher wattage, it will heat the coil in a heartbeat. Plus, you can bypass the wait by giving the bar a short squeeze before actually drawing to wake it up. I haven’t tested the temperature control feature too much, simply because I’ve never been a big fan of this feature. I did try it out with one of the stainless steel coils that come with the Elabo tank, and it seemed to perform pretty well. It didn’t once jump out of temp. control back into wattage mode, which was great, and I didn’t get any dry hits. That’s about all I can tell you regarding temperature control mode. To be perfectly honest, I wasn’t expecting very much from the Elabo Tank. I just thought it was a mediocre tank that Wismec just threw into the kit for people to start using the Predator 228 mod right away. I was wrong, because the tank is definitely above average, and even introduces an innovative refilling system that doubles as a child lock. 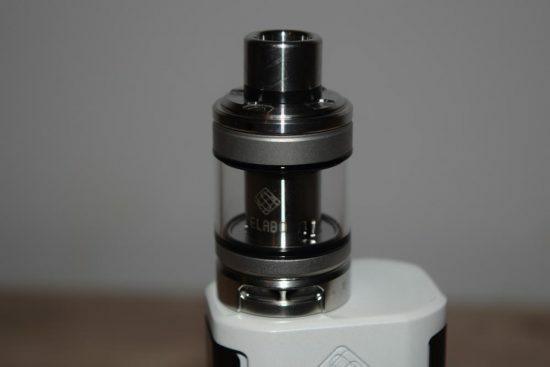 The Elabo tank measures 25 mm in diameter and 52.8 mm in length, from the top of the drip tip to the base. 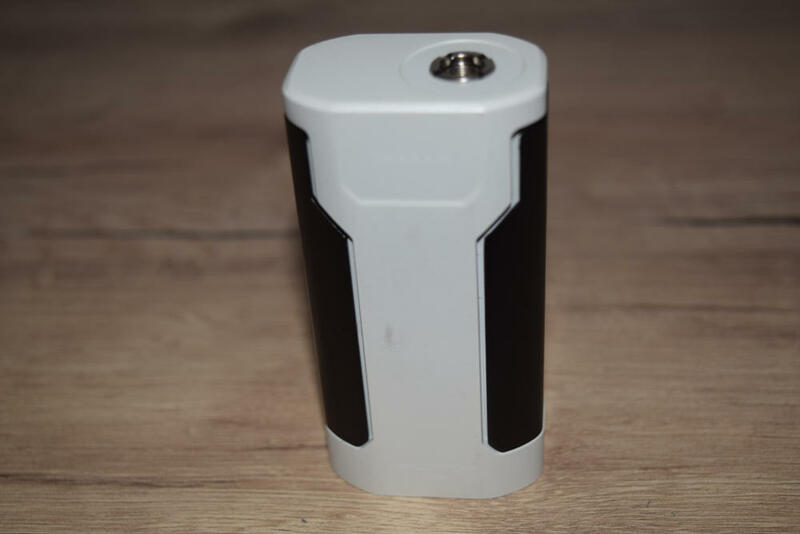 It has an e-liquid capacity of 4.6 ml with the larger of the two included coil heads and 4.9 ml with the smaller one. 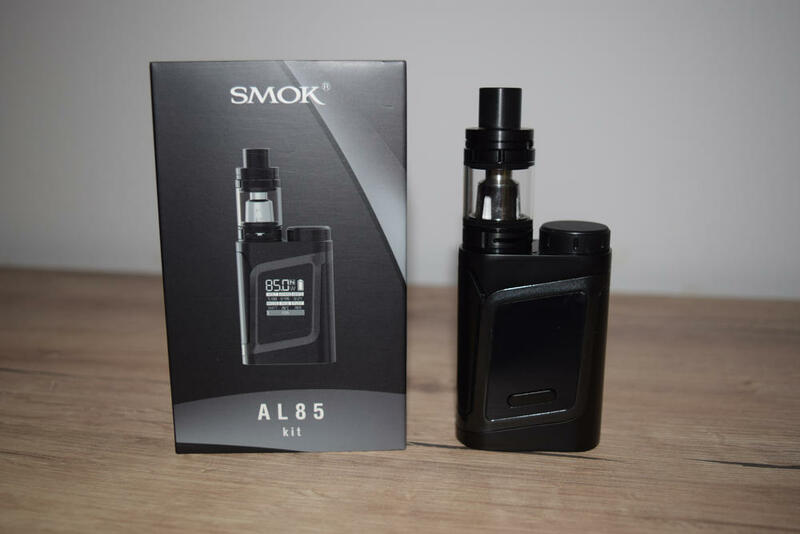 That’s pretty good for a mid-size tank, and what’s even better is that the coils are very efficient, meaning that they produce surprisingly large and dense clouds of vapour without using up too much e-liquid. For example, with the larger of the two coils, I go through two tanks of juice a day vaping at 75W. That’s pretty good in my book. 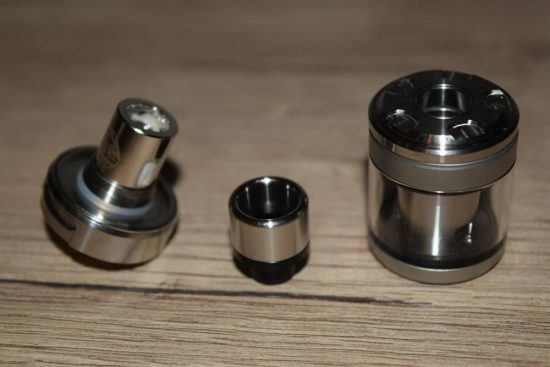 The tank only has bottom airflow, which consists of four mid-sized slots – two on each side – that can be opened and closed with a metal ring with stoppers on both sides. I prefer to leave the airflow wide open when vaping, for maximum vapor production, but if you’re willing to sacrifice a bit of vapor, closing up two of the four slots bumps up the intensity of the flavor. 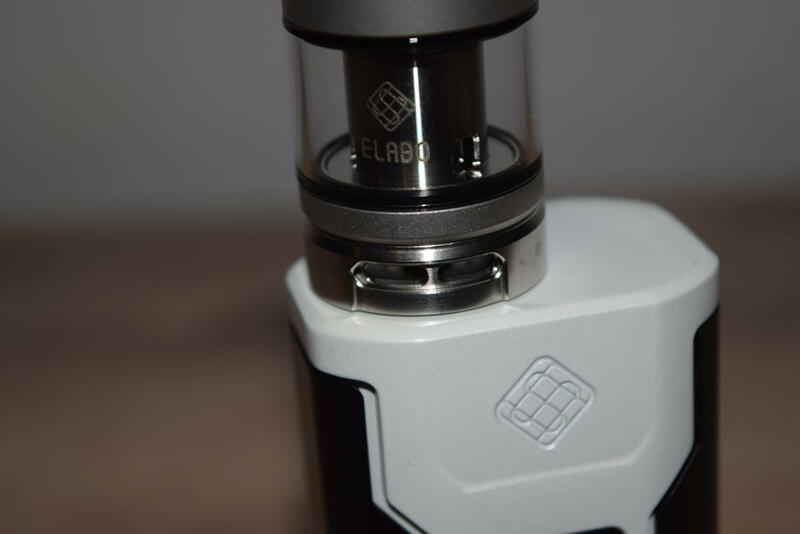 The Elabo comes with two different coil-heads, one 0.2Ω that can be used from 40W to 80W, and an 0.25Ω coil-head with a wattage range of 40W – 120W. It certainly doesn’t look like a coil-head that can handle 120W, and I didn’t risk burning it to find out, but it’s performing beautifully at 80W. Vapor production is way over what I expected, and the flavor is not too shabby either. It’s not on the level of a good RDA, but for a sub-ohm tank, it’s right up there with the best of them. The Elabo has a 3-piece design which allows you to unscrew the base and change the atomizer coil without having to drain the tank, and it’s really easy to piece back together. Just drop in a coil head and screw the base back on to the top section. The most impressive feature of the Wismec Elabo tank is the ingenious refilling system. To access the top fill port, you have to pull up the 510 drip tip, but not completely detach it from the tank, and push the top cap back. You can then add juice through the large fill slot and just snap the cap back when you’re done. Pushing the drip tip back down locks the cap in place. It’s easy, clean and acts as a useful child lock as well. Overall, the Elabo tank exceeded my expectations. It may not be the best tank I have ever used, but for something bundled in an affordable starter kit, it’s really nice. Challenging the SMOK Alien 220W for the title of most popular dual 18650 battery mod is a bold move by Wismec, but its Predator 228 does come with some very appealing features. The fast 2-Amp charging technology stands out, but there is also the balanced charging, the low discharge point of the batteries and the powerbank functionality. The Alien doesn’t have these, but it’s also a year older, which in the world of vaping makes it an old device. The Predator is not perfect, and it currently has a faulty 510 connection, but if that gets fixed (and I’m sure it will), it will be one of the best, if not the best, dual-battery device on the market. The unit tested for this review was sent to me by Heaven Gifts. I love the size and weight of the Wismec Predator. The fact that the firmware can be updated to keep the mod current. The left side hidden fire trigger button is delightful and easy to operate. With 50 Amp combined battery power it is possible to fire the Predator at 228w, I tried it once with Sony VTC 5’s my cotton caught light lol, at 100w or under the battery life is excellent. The Elabo tank did surprise me. While I personally think it’s a pretty ugly, plain tank, the performance I received was very good. The 4.6ml of e-liquid lasted me much longer than I would have thought, vaping at 80w plus I didn’t experience any loss of flavour. i have had this for 4 days now, haven’t had to charge it once! its so fabulous. great smoke and flavor too! highly recommend it!